Since we’re in the throes of construction, I wanted to give a little boost to morale and show pictures of my finished Droid Quilt! This is the twin size in “Old School Artoo Blue”. 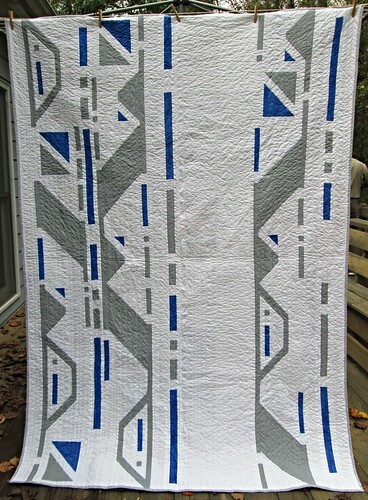 I did straight line quilting to complement the flow of the designs, and draw the eye along the vertical designs. Also, straight line quilting goes pretty fast! For the back, I used about 18 fat quarters’ worth of fabric from the newest Star Wars fabric line. I spaced in some pieces of the background fabric from the front, one of which can double as the label. I’ll give a little more instruction on how to lay out the backing like this as we draw closer to the end of the Droid Quilt Along! 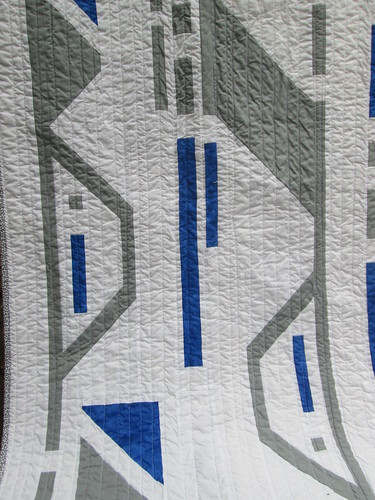 Get all the instructions on the Droid Quilt Along page! That is the droid I’m looking for! I love your quilt, and I hope to play catch up later in the year so I can play along. Great job!